Two classics unite in this wonderfully decadent Caramel Macchiato Cheesecake. Skip the coffee house today and enjoy a slice of this fluffy and silky treat perfect for the Holidays. The coffee lovers in your house will thank you. In food processor pulse two packages of graham crackers into fine crumbs. Add melted butter. Mix to combine. Press into greased 9nor 10 inch springform pan, working crumb mixture about halfway up the sides. Bake in 350℉ oven for 10-15 minutes or until golden brown and your kitchen smells amazing. While crust is baking, whip cream cheese until smooth in s stand mixer. (It is extremely important that the cream cheese be room temperature.) Scrape sides of bowl and add sugar. Mix until smooth and well combined. Slowly add one egg at a time, scraping the sides of the bowl between additions. While on low speed, add sour cream, heavy cream, vanilla and espresso very slowly. Make sure to stop the mixer and scrape the sides of the bowl with a spatula routinely throughout this process. This will avoid lumpy batter. Pour filling onto graham cracker crust. Place prepared springform into a large roasting pan. Slowly pour water into the roasting pan to about ½ inch in depth. Return to the oven for approximately one hour and ten minutes. The cheesecake will still be slightly giggly and have a sheen on the top when done. Cool cheesecake at room temperature. Once cooled enough, remove cheesecake from water bath. 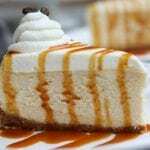 Refrigerate cheesecake overnight. Serve with caramel sauce and whipped topping.